Twist & lock lamp retaining ring with loop-in/loop-out terminal block. 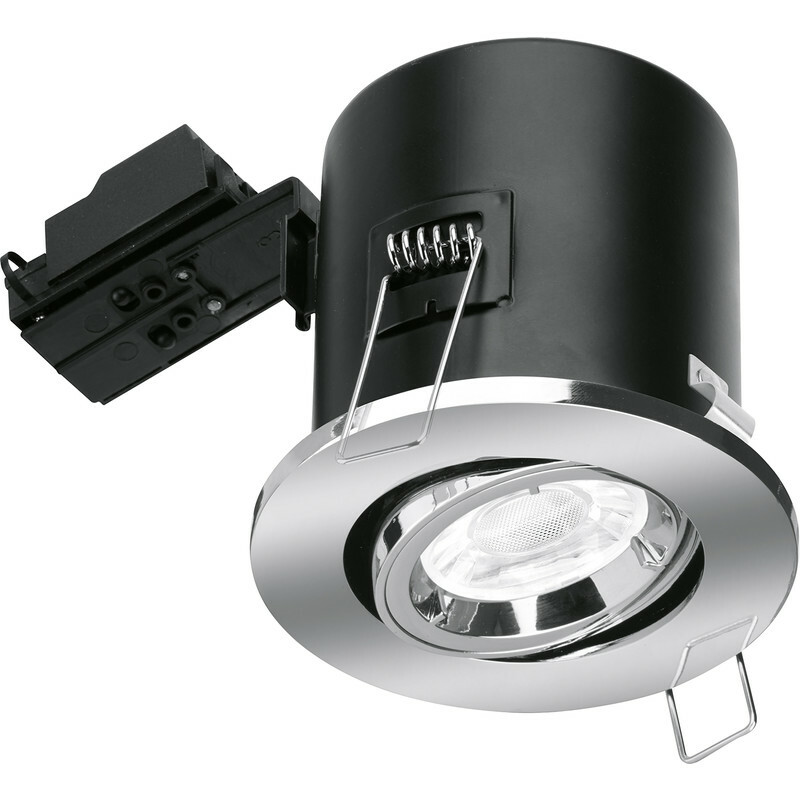 Enlite Adjustable Fire Rated GU10 Downlight EN-FD102PC Chrome is rated 4.7 out of 5 by 14. Rated 5 out of 5 by Rob333204 from Great features and finish After searching for hours it was the only place I could find led housings with all the features I wanted. Option to change bulbs easily, chrome, once installed ability to pull them away slightly from ceiling when required for painting, gu10, dimmable led compatibility. When installed the chrome finish looks great. There were some blemishes on the finish of some but you cannot see this from normal distances and for the price they are great value for money. Installed 6 months ago and they are all working OK. The electrician used a jab saw and a compass to mark out and cut hole required. Bevel overlaps quite a bit so you don't have to be too accurate. Rated 5 out of 5 by Davie 1 from Value for money! I bought a pair of these to replace old halogen eyeball lights in my en-suite shower room. These are really easy to wire and fit and are fire rated. They look very nice mounted and are a perfect match for a white ceiling, very happy! Rated 4 out of 5 by Rd350lc from Enlite adjustable Downlights These have been up for a couple of months now . Were straightforward to install and required a larger than normal hole , which worked out well for me as I was replacing old brass Downlights. The only slight niggle I have is the finish of the bulb retaining rings which is not up to the standard of the rest of the fitting . Rated 5 out of 5 by Joatmon from Just what I needed. Replaced original MR16 with this product. Excellent quality and easy to wire and fit. With LED 5W lamps it’s put a new light on the kitchen.